When you are struggling with a difficult personal or family situation, or grappling with any one of a number of distressing current events in our city, country and world, that upends the ground on which you stand, is there a life-giving practice or habit you have developed, to help anchor and reground you? coming to Redeemer and participating in various small groups and worship. The consensus of the group was that practicing compassion – “suffering with” instead of “suffering alone” – is in and of itself life-giving. Wherever you are on your faith journey, and however you are feeling about your life and the world around you, know you have a spiritual home of welcome and compassion here at Redeemer to help anchor you. It’s mid-July so this E-Redeemer reflection has become sort of an annual tradition for me as I return from vacation. 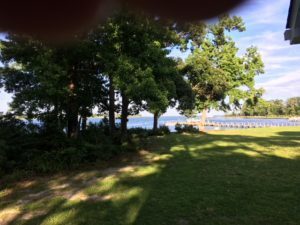 For the most part, I was down at our cottage in the Northern Neck of Virginia. We are right on the water looking out to the Chesapeake Bay. The view from our porch is beautiful and quiet; offering a backdrop for uninterrupted reading, resting and reflecting. Even at the Grave by Rev. Lisa Saunders, Episcopal Priest at Christ Church, Charlotte, NC. She reflects about what she has learned over the years from presiding at a number of funerals. Penelope Ayers; A Memoir by Amy Julia Becker. The story of a daughter-in-law coming to know her husband’s mother in the midst of her dying. The Spirituality of Imperfection: Storytelling and the Search for Meaning by Ernest Kurtz and Katherine Ketcham. A reflection about normalizing our human imperfections within our faith. Gut Feelings; The Intelligence of the Unconscious How does intuition work and how to develop it. The Work; Searching for a Life that Matters by Wes Moore. Wonderful book whose author is part of our fall Voices Series. Post Traumatic Slave Syndrome; America’s Legacy of Enduring Injury and Healing by Dr. Joy DeGruy. This was a fascinating and enlightening book about the long term effects of slavery on the African American culture/community today. Jefferson’s Daughters by Catherine Kerrison. The untold story of Thomas Jefferson’s 3 daughters; 2 white and free, 1 black and enslaved and the divergent paths they forged in a newly independent America. In addition to the reading, I also had my first true experience of “binging” (as in movies!) I re-watched Ken Burns documentary series The Civil War which I had seen many years ago but wanted to view again. It was fascinating and worth seeing on a more regular basis. In what turned into a very powerful emotional experience was watching all 5 seasons of The Wire. (Thank you Amazon Prime!). I had not seen it when it first came out but to watch it in 2018 in a condensed period of time was really hard and valuable. It felt like a current documentary about Baltimore. I wish there was some way to offer this opportunity to the parish because of the many implications for our city….but not sure how to realistically plan such an experience. Feeling disempowered by events in your life, our nation and our world? Looking to learn how to help make positive, impactful change in a way that reflects the values of our faith? Let me introduce you to some of the folks I’ve been spending time with this week. Arlene, a woman in her mid-twenties with an exuberant smile, is a former public high school teacher. She became increasingly frustrated knowing the overwhelming challenges her students faced outside of school and her own limited power as a classroom teacher to help them. A career counselor informed her of a fellowship in community organizing, which Arlene applied for and successfully obtained. She now works on the staff of WIN (Washington Interfaith Network) to organize and empower the Latino community in DC. Shanize, also in her twenties, has a similar story, finding her way to organizing disempowered youth in Louisiana after having first been a classroom teacher. And Percy, a retired postal worker from Little Rock, AK, has come upon community organizing in his retirement. Sporting a sharp bow tie and shirt yesterday at lunch, he relayed that his wife had packed these for him to wear. This past Tuesday, Day 1 of our training, we studied the Melian dialogue from Thucydides’ History of the Peloponnesian War and engaged in some entertaining role play as Athenians and Melians on opposite sides of an imaginary negotiating table. Yesterday we reflected on the concept of power. What is it? Where did we first learn about power? What is our relationship to it? Are we comfortable with the idea of power? Why or why not? Most of us shared how we first learned about power in our families of origin, from our parents, as well as from our teachers and bosses. What about you? Today we will head to a church in Anne Arundel County where we will be among 500 people gathered for a community organizing action (details forthcoming!). It is energizing and empowering to be surrounded by people so devoted and determined to be effective, strategic agents of positive transformation in their communities, in the areas of education, policing, affordable housing, immigration, employment, health care, among others. Hearing one another’s stories, learning from “masters” who have been in the trenches for a long time, and building relationships that plant seeds for future partnership and collaboration help to point a way forward, through what often feels insurmountable and impossible. May we together at Redeemer find just the right balance of both, to do what is ours to do and to be who God calls us to be, right here in our city of Baltimore. Can a prophet be accepted in his hometown? Every page in the newspaper this morning invited me to take sides against someone, often by attempting to discredit their point of view. The narrator employs an idiom intended to diminish Jesus’ newfound stature: his purportedly powerful hands are those of a working man, not a scholar, the carpenter-son of a woman named Mary. And as Barbara Brown Taylor points out in a sermon titled, “Sapping God’s Strength,” the only reason to identify someone by his mother in Jesus’s day was to question his legitimacy. Debie Thomas calls it a calculated “use of Jesus’s origin story to shame him into silence.” The people with the oldest ties to Jesus are so closed to the possibility of his growth that they stamp out their own. Nothing of note occurred with them, the scripture says. A young friend of mine got himself into trouble a few months ago. He did some things and said some things that offended the powers that be, and he was asked to leave his community. I’m not surprised by the ultimate decision—a system’s integrity requires clear boundaries—but Jesus’s experience suggests how likely we are to retreat to our corners and defend them, instead of meeting in the middle and risking an encounter of mutual respect. My friend was dispatched with a letter instead of taking part in a conversation, and I’m sorry about that. Whenever a person is put in a box, each of us is diminished. I wonder: Is a prophet destined to have no honor in his own country, or can we model something more life-giving for both parties? When we are offended, what if we assume shared hurt in order to find common ground? What if Jesus’s neighbors had admitted to him that something about what he was saying or doing rattled them or threatened them, but then each found a way to grow, together and individually? God is for us, each of us, full stop. Can we conjure the courage to be for each other, even when it seems like resources are limited, even we’re scared, even when we deeply disagree?